After styling an over-the-top, more-is-more tablescape for Thanksgiving, I felt drawn to a more pared down vibe for my Christmas setting. 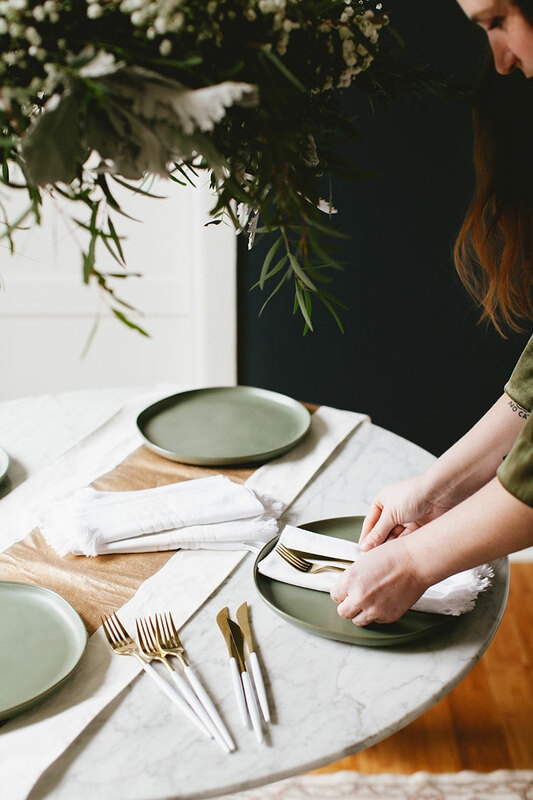 More than anything, I wanted my holiday tablescape to feel casual. To achieve this, I simplified the settings and layered together pieces to create a warm and inviting table with some major hygge, Scandinavian vibes. 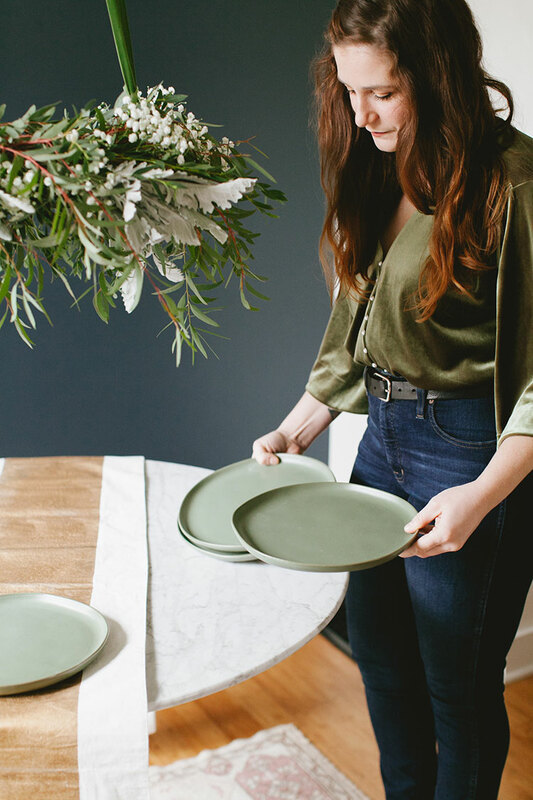 I still wanted the tablescape to be unexpected, so I eschewed the traditional red and indulged in an all green palette — especially after I picked up these Hearth & Hand stoneware dinner plates! Are you guys into Chip and Joanna Gaines? 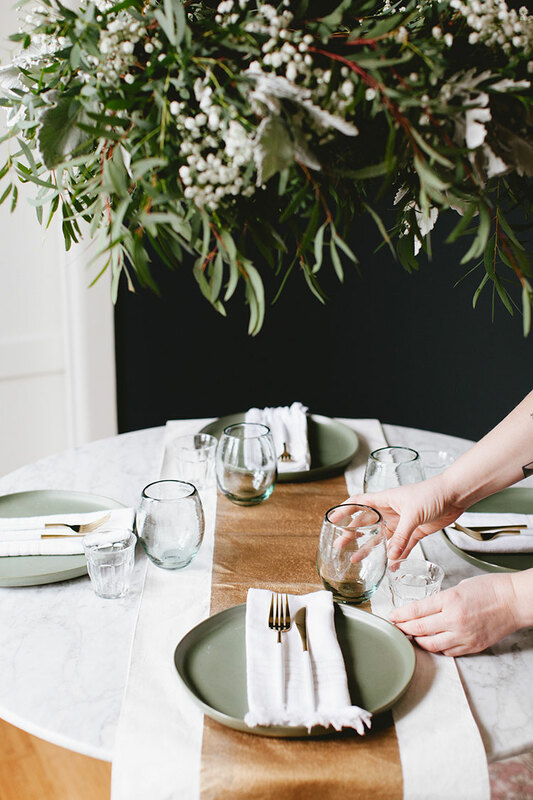 Not gonna lie, I am and definitely felt inspired by their aesthetic for this tablescape. Everything they do feels warm and inviting, so I just couldn’t help myself! 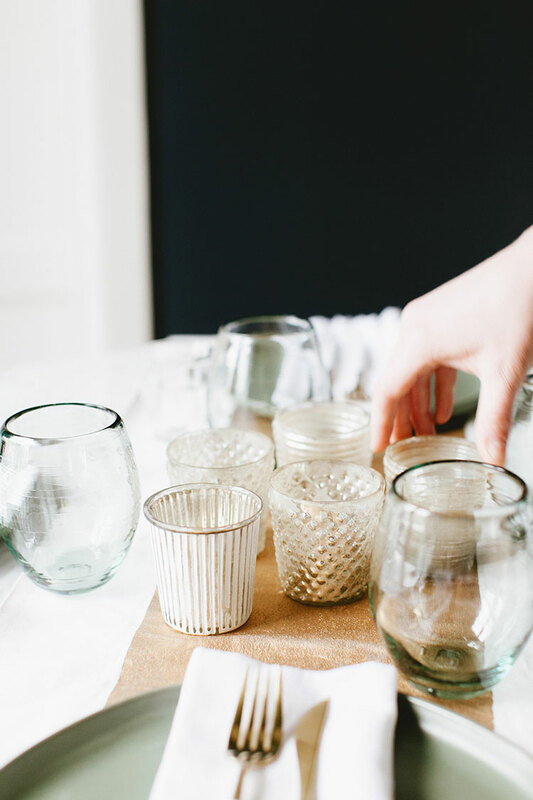 I kept the glassware fairly simple: recycled glass stemless wineglasses and my favorite faceted tumblers. The greenish tone of the recycled glass really sits nicely with the dinner plate! And, believe me, those glasses can hold quiiite a bit of wine in a pinch. They’ve been my go-to glasses for years and I adore them. 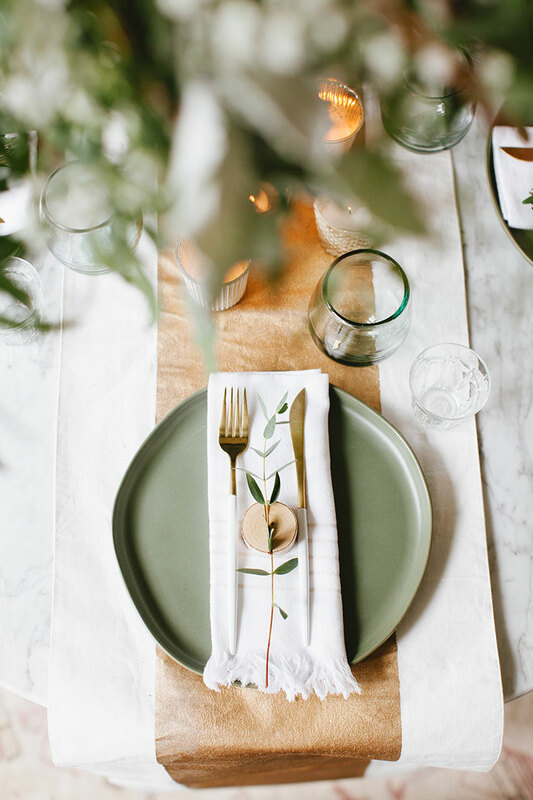 Even though I wanted my holiday tablescape to have a Scandi-modern twist, I still needed to include a touch of metallic gold. It is a Christmas table, after all. 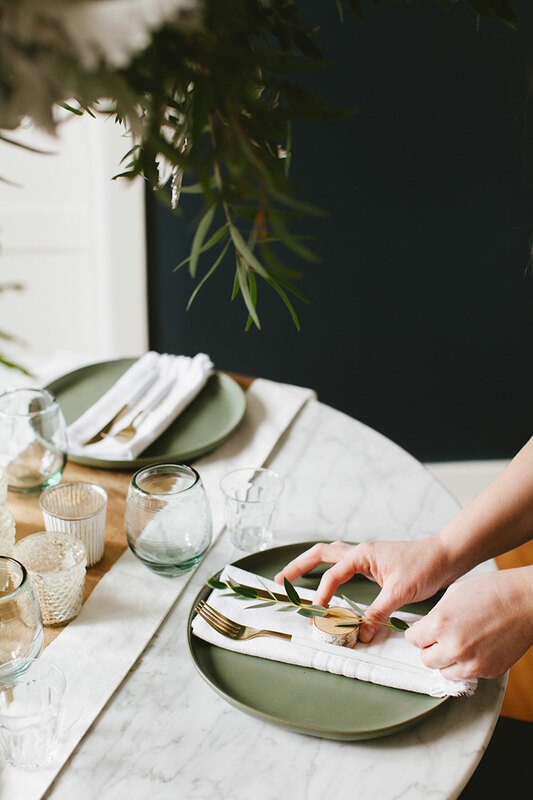 The gold stripe on the runner mimics the gold stripes on the napkins, so they feel cohesive and modern, but still understated. Plus the runner serves as a wonderful backdrop to the warm flicker of candlelight from the votives. 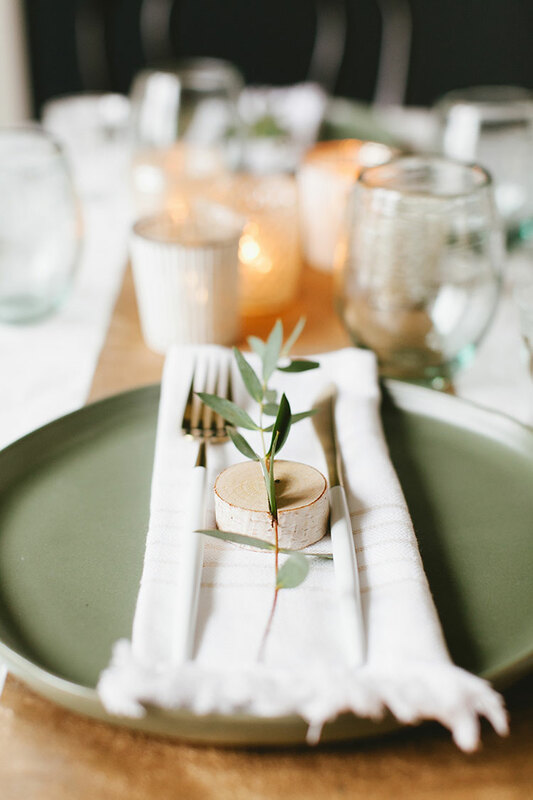 And for finishing touches, I used my favorite modern utensils and sliced birch place card holders. Instead of using them to hold a name card, which felt a bit stuffy, I inserted a single sprig of eucalyptus. It adds just enough texture and detail to feel special, but not too fussy. Last year for Christmas, we hosted people in the morning and throughout the day, but then had dinner with Sean’s family. I know the bungalow can’t hold that many people, so it feels really special to have a low-key, cozy dinner at the house, maybe on Christmas Eve. 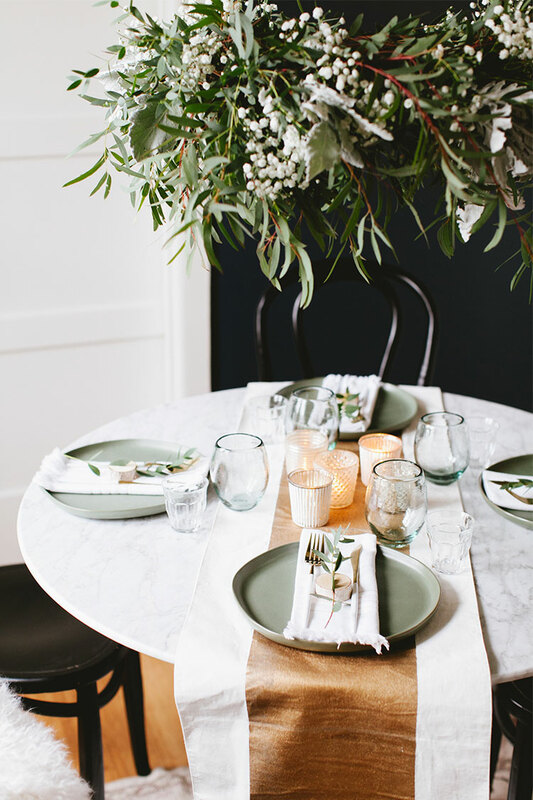 What do you guys think of this decidedly un-fussy holiday tablescape? 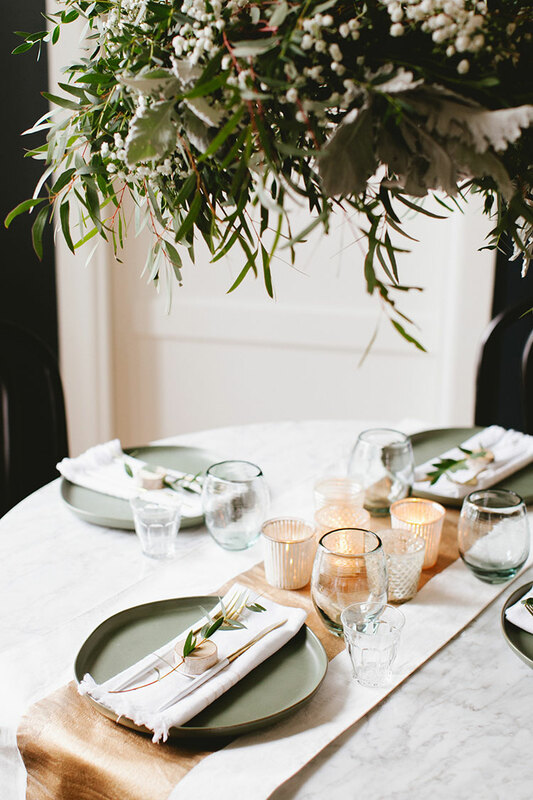 Sources: Heart & Hand stoneware dinner plate, West Elm table runner (similar), Anthropologie wine glasses (similar), Duralex tumblers, handwoven Mexican napkins, Pottery Barn mercury glass votives, Crate & Barrel stump wood place card holders, and white + gold cutlery. Wearing: velvet bodysuit, hi rise skinny jeans, bronze garnet cutout ring, and black leather belt. Photography by Meghan Klein. Styling by Jojotastic. 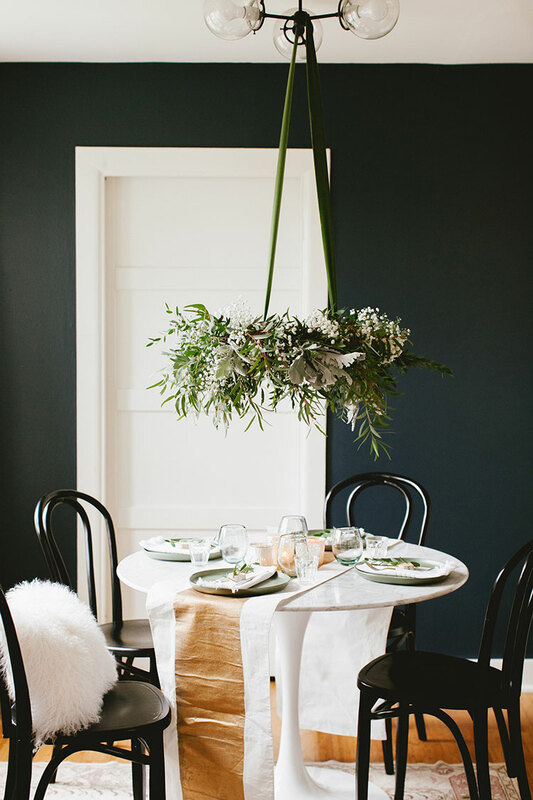 Get more entertaining posts here + stay tuned to learn how to make the hanging wreath centerpiece!